This delicious, cheesy side would go great with your favorite meat entrée! Arrange the potatoes in an ungreased 9×13-inch baking dish. In a small microwaveable bowl, combine the butter and garlic. Microwave on high for 30 seconds or until the butter melts; stir. 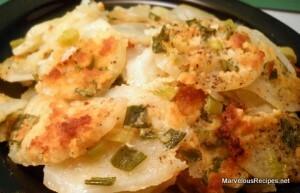 Drizzle the butter mixture over the potatoes; sprinkle with the green onions and Parmesan cheese. Bake at 375 degrees F for 40 to 45 minutes or until the potatoes are tender and light golden brown. Makes 4 servings. Oooh, my mouth is watering! THese look great. I know they would be a hit with my son and hubby. Even my daughter might want to try these.